This design was popular from the launch of Motorola RAZR V3. The upcoming device is named as GALAXY FOLDER 2. This is the successor of 2015’s Folder. Images and some specs of the device have been leaked on the web. Over the specs, Galaxy Folder 2 features a small 3.8 inches IPS LCD touchscreen with a resolution of 800 x 480 pixels. This foldable smartphone is powered by quad-core Snapdragon 425 processor clocked at 1.4 GHz coupled with Adreno 308 GPU. The company is offering a RAM of 2 GB on this device. Inbuilt storage of 16 GB which can be expandable up to 128 GB using a microSD card is also provided in the device. Over the camera, there is a front facing 5 MP camera for selfies and video calls. On the back, there is a 8 MP shooter which dynamic camera features. The dual SIM smartphone runs on Android OS Marshmallow v6.0. There is a full customization option in the OS which can enhance the quality of apps. The device is powered by 1,950 mAh. Along with this flip phone, Samsung is planning to launch another flip phone by the code name SM-W2017 (Veyron). The upcoming Veyron is said to come with 4.2 inches screen. It has quad-core Qualcomm Snapdragon 820 processor coupled with 4GB RAM. A 12 MP rear shooter is also included in the specs of this device. 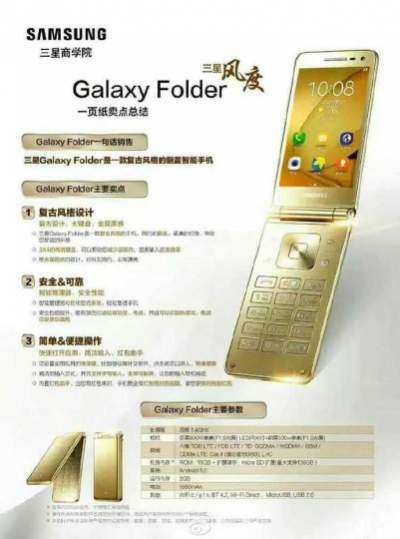 According to the leaked images, Galaxy Folder2 will be hitting the market in Gold color. Other color variants are not confirmed. Also, Folder 2 has cleared the TENNA certification and FCC. This device also got the Bluetooth certification. GF 2 has been code-named SM-G1600. This device supports 4G LTE support. On the connectivity end, Folder 2 offers Wi-Fi 802.11, Bluetooth v4.2, microUSB and WiFi Direct. There us not any official release date of this smartphone. But it is expected that Samsung will soon launch this smartphone. Samsung has already launched a wide range of flip devices, but no device has been appreciated by the customers. Previous articleKumkum Bhagya 29th August 2016 Episode: Aaliya decided to take revenge from Sarla ?